Biking and walking trails are sprouting up everywhere in Georgia…and the highly-successful Silver Comet Trail is among the most popular. Now, MillionMile Greenway announces another big trail idea: the Gold Belt Trail, designed to link the Silver Comet to other parts of North Georgia and beyond. MillionMile Greenway assists communities in Georgia and elsewhere to create and expand greenways and trails. Cartersville and Bartow County recently asked MMG to help connect them to the Silver Comet. The result is an anchor segment of the bold new Gold Belt Trail. 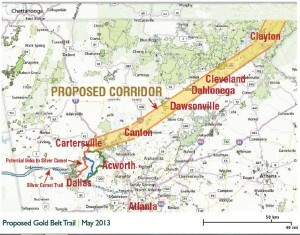 The Gold Belt Trail will follow the diagonal corridor across Georgia that geologists call the “Gold Belt” – linking gold mining and other mineral heritage communities with each other in a scenic bicycle and pedestrian trail. Imagine Dallas, Acworth, Cartersville, Canton, Dahlonega, Dawsonville, Helen and Clayton as links in a chain of gold nuggets from West Georgia to the mountains of North Carolina – spanning about 200 miles.